← 2018 Election News – All Seats Up For Grabs! “After almost a year in office, President Trump has yet to name a science adviser and director of the White House Office of Science and Technology Policy. Since World War II, no American president has shown greater disdain for science — or more lack of awareness of its likely costs.” According to “Trump’s Disdain for Science,” New York Times, 1/4/18. 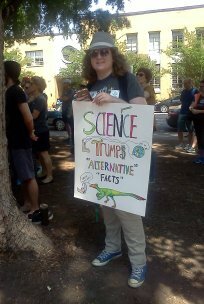 A few lucky cities/areas in NC have organized marches for science in 2018 – Research Triangle Park has one in Raleigh and the Triad has one in Greensboro, both on April 14. 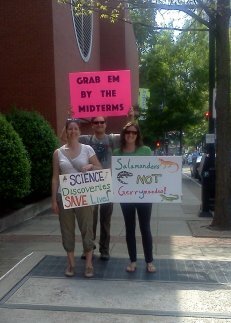 The closest to western NC (Charlotte and Asheville NC) may be the march for science in Spartanburg SC on April 21. Here are some details about NC events. There is always the big one in Washington DC. 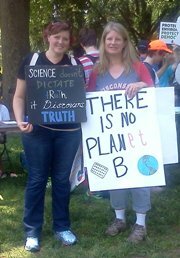 March for Science Triad is hosting rallies and a march to Celebrate Science for the Common Good! In these event, there is hope. And cleverness. And respect and appreciation for Science. Join us! This entry was posted in children, march, rally, Science, women and tagged children, march, rally, Science, women. Bookmark the permalink.